Drawing a fruit bowl is one of the first things beginning artists do. This is because a fruit bowl is based largely on simple shapes and shading, and it makes a perfect starting place for beginners to create something that looks good with little effort. Learn how to draw a bowl of fruit that will enhance your ability to draw shapes and illustrate the importance of shading technique. Draw a half circle with the rounded end down and the horizontal line facing up. This is the basis for your bowl. Add a second half circle just below the horizontal line, bringing the half circle in an arc from one end of the horizontal line to the other. This half circle give your bowl three-dimensional depth. Draw a banana next. Don't worry about being perfect. You just want to get the basic shapes of your fruit in place. Add a half circle or two for apples and oranges and space them out. 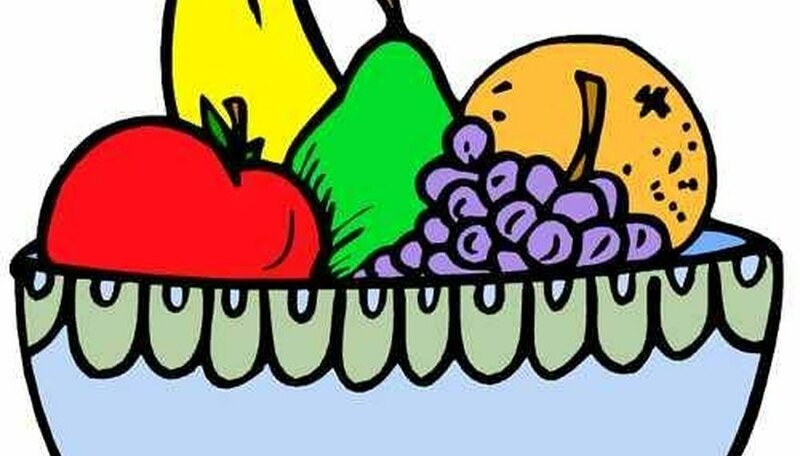 Don't draw full circles, because part of the fruit will be hidden by the bowl. Add a curved stem and draw little circles along the stem for grapes. Go back with your eraser and pencil and start defining the fruit until you've achieved the correct shape. Add a little shading to the inside of the bowl to enhance the depth and space around the fruit. You might want to add a couple of leaves or maybe have a couple of grapes hanging over the side of the bowl. Color the fruit with soft color pencils, pastels or even chalk. Use various pressure to give the fruit a textured quality. You can create light effects by erasing some of the color and create shadow effects by smudging. Do this until you achieve the look that pleases you. Color the fruit bowl brown. Add light black lines running horizontally to create a wooded texture. Go over the bowl with brown again, adding more pressure to thicken the wood grain effect. You can make the bowl look like any material you like, but wood seems to enhance the fruit.